Dotsie Bausch pedaled easily and took in the smell of the blooming flowers. She was enjoying an easy ride toward the ocean near her Irvine, Calif., home on a cool but sunny morning, and there was no pain. She was nearing the apex of her long, incredible journey from illness, and felt nothing beyond the same joy too many people leave behind in childhood: the simple joy of riding a bicycle. "I love so much about it," she said. "I just love being able to be outside with the wind in my face and the ability to see so much in a short period of time, if you go 30 miles or 50 miles or 70 miles. But I love the competitive aspect of it more than anything. I love track racing and I love the gift it's given me. It's been an incredible journey so far in just a short period of time." When Bausch talks about how far you can go on a bike, she isn't just talking about the mileage. Just a decade ago, she had been caught in the grip of an eating disorder that wasted her 5-foot-9 frame to a skeletal 90 pounds. She had been a high-paid runway model snorting away money with drugs, dieting and vomiting away her body and -- at one point -- trying to end her life. But that same body survived and became capable of riding up mountains and sprinting nearly 40 mph. That same body will likely go to London in July to represent her country as an Olympian. "It's a whole new level of understanding of where my body will take care of me if I take care of it -- its resiliency and the amazing turnaround that it's capable of," Bausch said. "Suddenly, it's a whole new body. This is not the same body I had." Cycling, simply, helped guide her through an even more arduous journey. Bausch stuck the spoon down her throat until she vomited. She had gorged during a meal, and now it was time to punish herself and rid her body of those awful calories. Others would see a young woman so beautiful she received thousands of dollars a day to pose on a catwalk; Bausch would look into a mirror and see a body that needed to shed even more pounds. She hadn't always been this way. Growing up in Louisville, Bausch had the body and zeal of an athlete. She competed in horse riding and cross-country running, and when she went to college at Villanova, she rowed crew. At least, she rowed for a year. When early-morning workouts grew to be too much (getting up at 4 a.m. tends to limit the typical college experience), she quit. After dieting to lose the weight she put on for crew, she started modeling in her senior year, 1995, and was soon working as a runway model in New York. "It would be anywhere; $5,000-$8,000 for a night. All you would have had to do was go to a fitting before that," she said. "It definitely could end up being 40 grand in a month with a very light amount of work. It's a lot of money when you're 21. It's a lot of money now." It came at a price, however. Bausch began using cocaine and other recreational drugs. Even worse, she was developing a dangerous case of anorexia that transformed into life-threatening bulimia. "Eating disorders are very comparable to drug or alcohol addiction. It's often the mask for something else internally that is wrong. It's just the outlet the person is using," Bausch said. "For me, that's what it was. I was feeling out of control at that point in my life. I had majored in journalism in school and, after a summer internship, I realized that was something I didn't want to do at all. I didn't really like it like I thought I would. I felt scared and out of place." 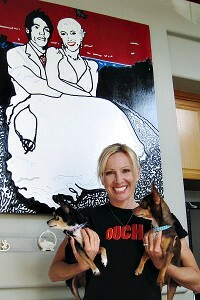 Dotsie Bausch currently lives in California with her husband, Kirk. Though Bausch didn't feel like she had control over her life, she could feel a small measure of control by restricting her diet. "I guess I got a sense of power from that because I was in control of that," she said. "Food is something that is very hard to restrict, right? You're hungry every five hours, so it's difficult to do. So I felt like I was accomplishing a challenge. It creeps in slowly and evilly. It isn't just one day -- boom! "Then it gets connected to the visual aspect. You get connected to the scale and the way clothes fit. Then it becomes something called 'body dysmorphic disorder.' What you see in the mirror is not really what's present. What you see is very different from what other people see. I had that very intensely. It grows legs and fingers; it's a nasty disease and it multiplies. It's like a drug addiction where you start out smoking pot and, at the end, you're smoking meth. One thing is not enough." Her mother, Margie Cowden, noticed there was a problem when Bausch was a junior at Villanova and went to the dean of students to ask for help. She was referred to a psychiatrist. Dotsie saw the psychiatrist. It didn't help. "I tried to intervene, but she wasn't ready to get well at that point," her mother recalled. "It's like alcoholism or drug addiction -- they have to be ready. And she wasn't ready to get well. She was saying she didn't have a problem. She had to go downhill a little more." She went downhill a lot more. She avoided her family, and now says she is glad she did because they didn't see what her body had become. "You're not getting nutrients, so your skin is gray and your eyes are hollow and your hair falls out," Bausch said. "The normal process your body goes through every day, it can't do because you're not giving it nutrients. The body can't function. Your liver and kidneys start not working right; you can completely shred the lining of your esophagus from the acid that comes up. Girls with bulimia have really bad teeth that are black and rotting out from the acid." Finally, Bausch said, she became so sick that she decided to kill herself. As she tells it, one night she left her residence and walked through Philadelphia to the edge of I-76. She stood at the edge of the interstate, watched the vehicles speed by at 50, 60 mph. She climbed over the highway barrier, ran onto the highway and stopped midway. She turned and saw the headlights of cars and SUVs swerving to avoid her. She said her memory of that night is hazy, but she realizes that running into traffic is a poor suicide method. What saved her was the simple instinct to get out of the way. She dashed across to the other side of the road, to safety, to start living. "I didn't really care whether I would live or die, but I realized how selfish that would be to do that to my family," she said. "That was the instigator. And then, through the help of therapy, I wanted to live." With tears in her eyes, Bausch leaned against a tree and vomited. She did so this time, however, because she was healing. She was on a bicycle and quite literally riding on the road to recovery. As part of her anorexia, Bausch had become addicted to exercise, spending hours on elliptical and endurance machines that drained her weight. So when she began therapy, she was told to avoid exercise until her counselor decided she was healthy enough to begin again. But this time she was told to try a form of exercise new to her so that memories would not link her to the disease. Having moved to California and begun a new career in video production (and given up drugs as well), she chose cycling. 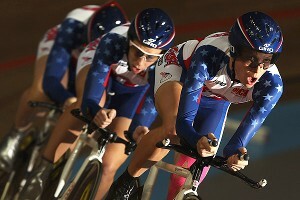 Dotsie Bausch is vying to make her second U.S. Olympic track cycling team. She fell in love with the sport the moment she sat on the bike. She entered one distance ride after another. During a particularly demanding stage race, she rode so hard to keep up with the stronger cyclists that she had to stop and throw up from the exertion. Jim and Katie Safford, who had formed an amateur women's cycling team, Team Earthlink, stopped to help. "We had noticed her during the previous day's stage because she was on this really, really odd bike, and it's very unusual to see a statuesque blonde like her on a bike," Katie recalled. "We watched her in the criterium and she did everything wrong, but she hung on to the back of novice field." And there she was, throwing up at the side of the road. "Jim said to me, 'You've got to get her back up on her bike or she will cramp up something awful,'" Katie said. "I went up to her and I said, 'Get back on your bike,' and she said, 'I can't, I can't.' We rode around for a while and then she got back on the bike. Later she asked, 'Why did you help me?' I said, 'We saw something in you. You were doing everything wrong, but you were super strong and had a win-or-go-home mentality.'" The couple encouraged Bausch at several races over the next year as she progressed rapidly from a Category 4 rider to a Cat 2. The next year, they asked her to join their team and she quickly accepted. She was so eager to get into the sport, she told someone on an elevator that she was a pro cyclist before she actually was. "I lied. That's the truth of it. I lied," she said with a smile. "And when I got off the elevator, I thought, 'Oh my gosh, I just said that out loud. Why did I say that?' It was happening before it happened. I so badly wanted to go on that journey and have that as a livelihood and a challenge that I was saying it was the case before it was the case." The funny thing is, it did almost happen that fast. She took up cycling in 1998. By 2002, she was on a pro team. The following year, she was racing for T-Mobile in the 2003 women's Giro d'Italia, finishing 25th out of a start list of 168 and fourth among American riders. Over nine days, her body had carried her more than 500 miles, her legs powered her up steep mountain roads, across bone-rattling cobblestones and around frightening curves. She rode in draining 95-degree heat, through pavement-slickening rain and in darkness through the filthy streets of Naples. She endured testers drawing her blood and ferried water bottles to her stronger teammates. She collapsed, exhausted, into bed at night and woke the next morning to repeat the previous day's demanding schedule. When she rode across the Punta Della Liberta causeway into Venice during the final stage time trial, she could scarcely comprehend what her body had done. "I could barely race the time trial because I was so overjoyed and ecstatic because I was riding this," Bausch recalled. "I could barely believe it." Bausch was cycling away from disease. "There is obviously a portion of my personality that fits in that need to push myself to some degree most people would consider uncomfortable or painful -- that's obviously in there," Bausch said. "I can use that in a really positive outlet or not." "I love to see her race -- I love to see her race. So does my husband," her mother said. "I guess the best way to put it is she puts a smile on my face, and in my heart, too." 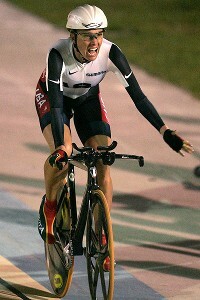 Dotsie Bausch was part of the long track cycling team in the 2008 Beijing Olympics. Eventually, however, Bausch topped out in road racing. She was getting older, and while she was very good, she wasn't quite good enough to make it to the Olympics. She considered quitting the sport and focusing on her career as a personal coach and in an online retail business with her sister. Instead, she turned to track racing, though she had been too frightened to even ride on a velodrome when she was starting out with the Saffords. "She was scared of death of crashing," Katie said. "When we took her to the velodrome, she started hyperventilating. She had to go out and do jumping-jacks. It made her dizzy. She never rode on the track when she was on our team. She only rode on the road with us." Former T-Mobile teammate and Olympic track cyclist Sarah Hammer, along with husband/coach Andy Sparks, loaned Bausch a track bike and helped her make the switch. Despite her earlier fears, she soon felt safer and more comfortable on the track than on the road. Bausch's husband, Kirk, recalled when she rode for the first time at the 2009 track national championship. She fell out of the starting gate, and because her shoes were wrenched so tightly to the bike pedals, she was trapped by the bike on the ground. "She was like a turtle on its back who can't get up," Kirk said. "Sarah comes over to help her and said, 'Don't worry about it, it happens all the time.' And Dotsie said, 'Oh, then I don't feel so stupid.' Then she started out slow so she wouldn't false-start again and she had to make up time the whole race." She won in the end. Afterward, she thanked Hammer for calming her down. "I just said that so you wouldn't stress," Hammer replied. "It never happens." When team pursuit was added to the Olympics, Bausch had a new goal. The former runway model could still become an Olympic athlete. "Anything professional -- sports, business, whatever -- you hit a lot of rocks and bumps in roads," Bausch said. "There are a lot of days you think, 'I can't do this; I'm not cut out for this.' It's definitely ingrained in my personality to not give up. After what I went through, this is like, 'No, you're tough enough for this. You enjoy this. The eating disorder, that was horrible and you went through it.'" Bausch speaks out about her experience so she can help others with eating disorders. She knows that the better she does on the bike, the more attention will be paid to her, and thus to anorexia and bulimia treatment, which can cost $35,000. She already works with Courageous Voice, a program that helps those with eating disorders. "There is no better person to help someone sick than someone who was sick themselves," her mother said. Bausch, Hammer and Lauren Tamayo finished fifth at last week's world championships in Australia. The U.S. Olympic team selection is complicated, but she and her teammates will likely compete in London. After that? "I'll definitely spend a lot more time to grow the business with my sister, and to be very involved in Courageous Voice." The Olympics are in sight. The eating disorder is far behind her. "I'll always be an athlete and always be connected to cycling," she said. "You can celebrate it and do something positive for it or not. And, for me, there is no possible way the eating disorder would come back. I did way too much work to not have that be part of my life, and using tools to work through what was going on underneath so you're not acting out in the eating disorder. "It's not even an option."